Not everyone needs a £150 motherboard with more extra components than you'll ever use. Sure, it's nice to have a couple of Gigabit Ethernet ports, on-board WiFi and support for ATI CrossFire, but rarely are these all used. If you're not paying the earth for the backbone of your system, you can spend a little more on the graphics card, CPU or memory to get more performance for the same money. Of course, there is a line drawn with cheap motherboards and there is a point where saving money becomes counter-productive. After all, you don't want to compromise on stability and even overclocking to an extent. However, inexpensive Gigabyte boards like the GA-P965-DS3/S3 have previously offered great value for money and tremendous overclocking experiences, even if it did take until the F5 BIOS to achieve it. 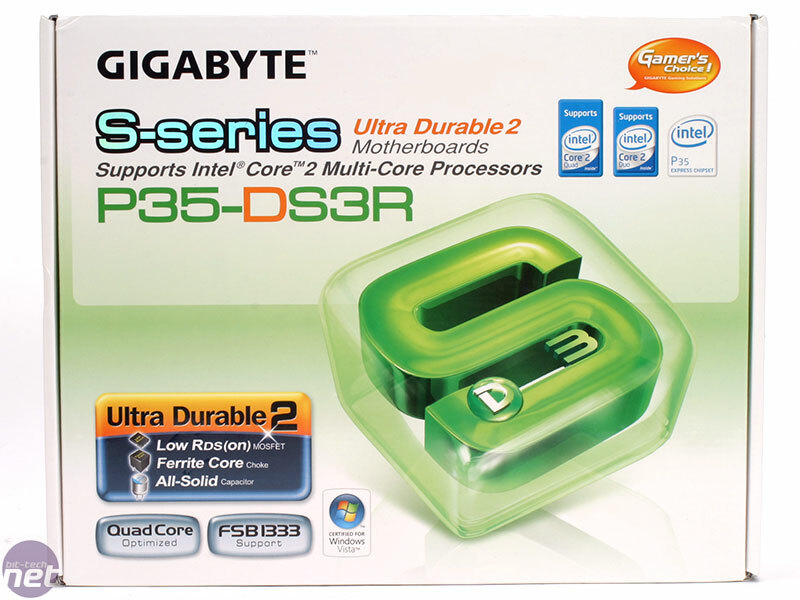 With that in mind, will the Gigabyte GA-P35-DS3R follow in the footsteps of the GA-P965-DS3? 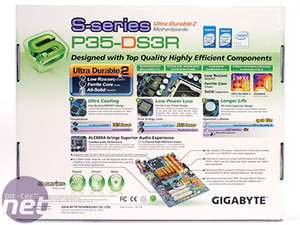 Is this another powerful budget board from Gigabyte? We find out. Xpress Install - The driver CD will install all the drivers systematically. In practice we've found the audio driver needs manually updating from the device manager when running XP, but that's a "feature" of Windows XP HD audio. Xpress Recovery 2 - A backup utility for FAT/NTFS PATA and SATA hard drives that allows you to backup, compress and restore system data. 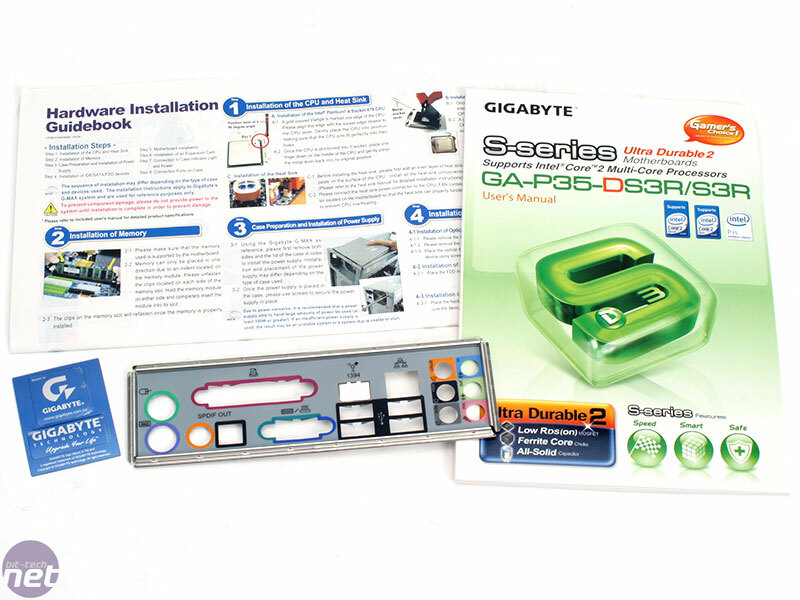 Included is a detailed manual and quick install guide with plenty of pictures and clear explanations. 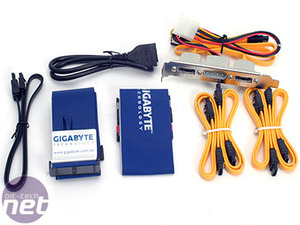 There are only four SATA cables for eight internal ports, with another two cables being routed to the PCI bracket giving the choice of eSATA if necessary. This bracket allows you to use a normal hard drive externally with ease, or up to two eSATA hard disks instead. 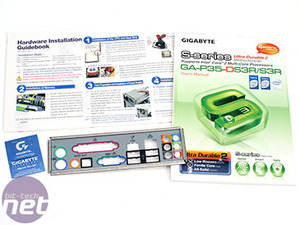 One eSATA to SATA data and power cable is provided, so you get the choice of either for two true eSATA drives or one standard hard drive, modified for external use. This is clever addition which gives you the choice of using eSATA or just having more internal ports but it does come at the cost of PCI space. No extra USB PCI brackets are in the box, despite the motherboard supporting eight USB ports through pin-outs on the main PCB. 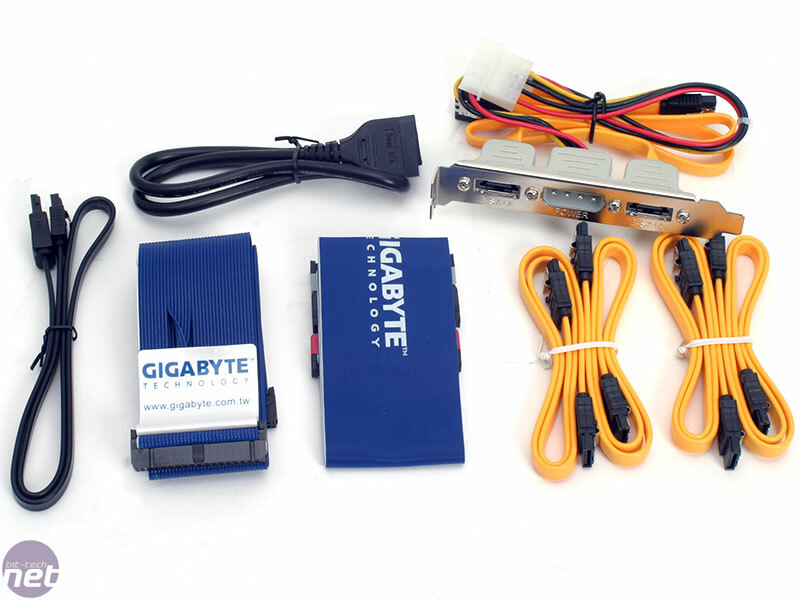 We can understand that Gigabyte is trying to keep costs down, but we'd rather a PCI bracket with four extra USB ports than the clever eSATA apparel. They are available as optional extras, but good luck trying to source one from somewhere. The DS3R legend is back, and we take the latest budget "energy efficient" P45 from Gigabyte to the cleaners, to see if its whites are whiter than white. 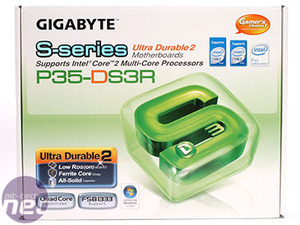 Energy Efficiency seems to be the industry buzzword for 2008 and Gigabyte has completely relaunched its P35 motherboard range with that in mind. We look at its mainstream GA-EP35-DS4 model to see if it's a fuss worth making.